This weeks challenge was to use the tangle copada, my response was to use it in a banksia design. Banksias are an Australian native, when the flower head turns into a seed pod, the result quite a big, woody pod which has "mouth" shapes all over it where the seeds have been expelled. I have used copada by flipping and stacking each row to create the mouths of the banksia seed pod, with a little bit of shing, sort-of, in the leaves, too. 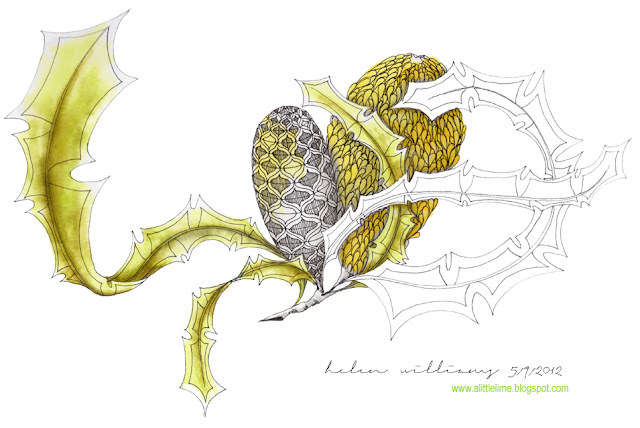 This design shows the flower and pod along with some pretty large, wild leaves! Depending on the type of banksia the leaf sizes vary, but the yellow banksias that I am familiar with have a profusion of large, long leaves (though maybe not quite as big as mine!) Happy with the concept of this design, if not loving the execution - probably due to the dull colour range. The flower/pod are shaded with grey first with some yellow added and I think this contributed to it feeling a little insipid. Ah well, I know for next time. Can't wait to see what everyone else has been up to with this one. Very unique I almost did not recognize Copada. The whole picture is Beautiful! a great concept to use Copada in the form of a Banksia. It is very beautiful indeed! :) I can see the leaves are also like those on Banksias. great work! This has a wonderful organic feel to it. I really like how you stacked the copada up and now I'm off to look "Banksia". So carefully thought out and executed! Lovely! You are a genius! I love your designs! I see that you also tiled this tangle I is a very nice effect. Wonderful idea. I was introduced to your blog recently and I'm in love with your graceful style and use of so many unusual flowers. I've tried several of your tangle patterns, so thanks for sharing them. This ZIA, like all your work, is just stunning! Keep up the great work. It's lovely, and I'm fine with the limited color. A few people have used Copada back-to-back, something I hadn't thought of! Wow! This is impressive. I saw Copada as a border, but I love your interpretation. It's wonderful to see how tangles take form from one hand to another. Beautiful job. I really like the stacking of the design. I hadn't thought of that... I love it! Lovely! This has such a delicate feel to it. Love it! As it's a windy day here in Tassie, I can see your handsome banksia man clinging to the branch and grateful for the large leaves for a bit of protection. This is gorgeous--I just love how you incorporate the tangles into such a natural design and give it your special touch. Beautiful! This is lovely, particularly enjoy your subtle color play, not dull at all. Beautiful work! I think it's beautiful and so different from others. The yellow is nice. Very elegant, and very creative! Well Helen, I admire your work. You always make such a beautiful tangle designs within real natural stuf. The color chois maybe not your favorite, but I love it anyway. Your design of Banksias is awesome, the color is wonderful. Love your tile....the combination of finished and "unfinished" look is fabulous...just the right amount of color!